There's no question Apple faces big challenges in the months ahead. Apple's reported revenue of $98.115 billion in the first six months of the current fiscal year represents a year-over-year revenue growth rate of 14.73%, well off the 66.35% revenue growth rate in the first six months of the prior fiscal year. Additionally, Apple's revenue growth reliance on the iPhone and iPad lines is creating challenges in light of the success of the Pad mini and the corresponding drop in average selling prices for the line. In this article I will explore the factors that have compromised Apple's recent rates of growth and the opportunities available to the company as it continues on a long and winding road of recovery. Over the first six months of the current fiscal year nearly 75% of Apple's reported revenue was sourced from the iPhone and iPad lines. The chart below illustrate the high concentration of revenue in Apple's two most popular device lines. It's interesting to note Apple's recently recast iTunes/Software/Services revenue segment now delivers more recognized revenue than the iPod device line and the Accessories revenue segment combined. The Macintosh line represented 11.2% of revenue in the first six months of the current fiscal year versus 14.8% of revenue in fiscal year FY2012 that ended in September. The chart below illustrates the rates of revenue growth for each of Apple's revenue segments for the six-month period ended in March. In the first two quarters of the current fiscal year, iPad revenue rose 29.18% on a 55.47% rise in units sales to 42.337 million units. The iTunes/Software/Services segment was Apple's second-fastest growing segment with a 26.01% growth rate to $7.801 billion. Negative revenue growth delivered by both the iPod and Mac lines in the first half of FY2013 contributed to the rising revenue dependency on the iPhone and iPad lines for aggregate revenue growth for the company. The graph below illustrates the change in average selling prices for the iPhone and iPad lines since the first fiscal quarter of FY2011. Despite a 55% rise in iPad unit sales in the first half of the current fiscal year, iPad revenue rose only 29.18% year-over-year due to the popularity of the iPad mini. This October, following the first anniversary of the iPad mini's release, unit sales growth and revenue growth for the product line will move more in tandem. In contrast, over this 10-quarter period stretching back to the first quarter of FY2011, iPhone ASPs have remained fairly consistent. Falling iPad ASPs and negative revenue growth from the Mac and iPad lines pushed the iPhone's revenue in the first two quarters of FY2013 to nearly 55% of the company's reported total. The graphs below illustrate unit sales and revenue growth for the combined iPhone and iPad device lines. Revenue growth for the combined device lines has not kept pace with the rise in unit sales. In the first two quarters of FY2013 combined iPhone and iPad unit sales rose 28.40% to 127.556 million. Over the same six-month period combined revenue for the product lines rose 19.22% to $73.035 billion. The Apple iPad is currently Apple's fastest growing device line measured by the rates of revenue growth and unit sales growth. There's no arguing the iPad mini is a commercial success and has driven iPad unit sales and revenue significantly higher. But this fiscal year the rate of revenue growth will dramatically trail the rate of growth in unit sales. There's rampant speculation Apple will release a lower-cost iPhone along with speculation Apple might release a so-called low-end iPhone to drive unit sales in emerging markets. I discount suggestions Apple will chase the smartphone market to the bottom. While a lower-cost iPhone may impact average selling prices similar to the way the iPad mini has driven down the iPad line's average selling prices, chasing unit sales with a low-cost iPhone will deliver little to support the company's overall top line growth. The iPad mini is a lower-cost iPad but not a low-cost device. I expect Apple to deliver a lower-cost iPhone in the fall to reach further into emerging markets and reach new tiers of customers in Apple's established product markets. But there's a definite cost to the rate of revenue growth in releasing lower-cost devices while in the pursuit of rising unit sales. In the first six months of the current fiscal year, iPhone unit sales growth slowed to a pace of 18.18%. Reaching new customers with a lower-cost handset may boost unit sales and revenue. But more is needed. At WWDC earlier this month Apple CEO Tim Cook laid out the framework for the commercial development of Apple's global eco-system and operating systems over the next year. Apple currently has over 575 million iTunes account holders and 300 million Apple-branded device owners are using iCloud. Since inception of the Apple App Store, the company has distributed more than $10 billion to developers. 93% of iOS device users visiting Apple's app store are using iOS 6 and 35% of the 72 million Mac users around the world are now using Mountain Lion. Over 240 million people are using Game Center, Apple's social network for handheld gamers. Fostering eco-system growth is at the center of Apple's device strategies and new product decisions. Apple's future lies beyond the iPhone and the iPad. It will be defined by the company's success in delivering rich content and services across a range of Apple-branded devices, including the iPhone and the iPad as well as yet to be announced new products. 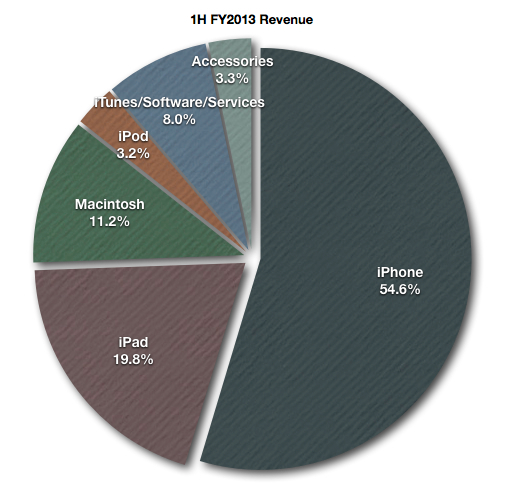 As noted earlier, close behind the iPad line in revenue growth is the iTunes/Software/Services segment. This revenue segment is producing fairly consistent sequential and year-over-year revenue growth in contrast to the seasonal revenue growth cycles produced by the iPhone and iPad lines. At WWDC Apple announced the release of new Airport products based on 802.11ac and new MacBook Airs using the new wireless technology. Over the next year, all of Apple's major device lines will be migrated to 802.11ac high throughput Wi-Fi. Little mention was made in conference coverage that Apple has opened iOS for 3rd-party game controllers. At the center of Apple's next device initiative is the living room and increasing revenue yield from existing and new eco-system participants. 802.11ac will provide the throughput necessary to integrate all of Apple's device lines in the planned living room solution. Apple will deliver a lower-cost iPhone this fall along with the expected iPad refreshes and the successor handset to the flagship iPhone 5. But Apple's product and services model is built on eco-system growth not necessarily product line market share and certainly not chasing unit sales with low-cost products. It will take several months for the eco-system framework announced at WWDC to materially benefit the company's top line and bottom line. In the meantime, expect a lower-cost iPhone as a means to expand the number of eco-system participants. The iPad mini has demonstrated a lower-cost iPhone isn't a panacea, but it's an incremental step that will promote revenue growth as the company plans its next big disruptive step. This is a long and winding road for Apple. The path revealed at WWDC was the first step in the growth recovery journey.